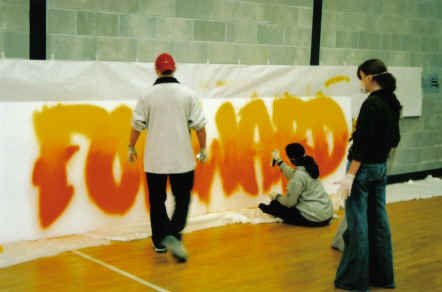 I practised my graffiti art in and around London for many years, painting in the dark of night. My friends and I decided that it was a dangerous way to be living and contacted our local council. From this, we set up a graffiti group who were given grants, a place in the local park to paint and commissions for the local youth club. 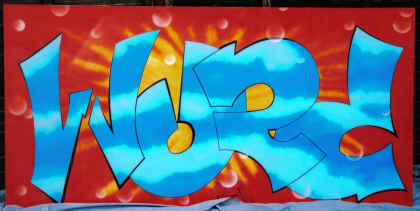 Im still working in a graffiti style, although now I mainly do boards or canvases. I am still asked occasionally to do the odd youth club. I am also producing miniature pieces for those who do not have the space for standard size graffiti. I am now running courses at local youth clubs and skate parks to teach youngsters how to practice this art form. These classes boost not only artistic abilities but also confidence. There are no pencil guidelines in graffiti, you just have to be confident and go straight in with the paint. Please follow the link below for more information on these courses.